Are you going to have a student teacher in your classroom this semester and want to find a creative way to welcome them? 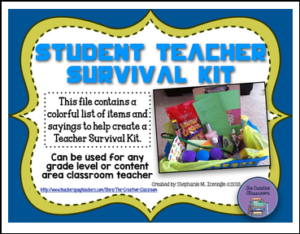 Download my Student Teacher Survival Kit product. This fun and inexpensive gift will surely help calm any nervousness and ease your student teacher into her new role. I created this file while I was making a Student Teaching Survival Kit for my student teacher and thought I would share it. In addition, I have added a survival kit for teachers. This can be used to welcome a new teacher to your team or school. It can also be a great gift to teachers that you mentor or coach on your campus.